Do you have Teachers Union memorabilia? If you have membership cards, programs or photos from TU events, photos of the Union building on 15th Street, copies of Teacher News or anything else, would you share them with us? The actual items will be filmed for use in the documentary, then we'll display them for you to see here on the Multimedia Archive page. We'll return all items you'd like back. Just e-mail us first to tell us what you've got and we'll contact you to make arrangements. Rick Winston has been looking into the impact of the red hunt in Vermont. His article in Vermont History can be read at http://www.vermonthistory.org/journal/80/VHS8001SinisterPoison.pdf. Rick's parents, Leon and Julia Winston, were among the New York teachers investigated, He tells his family's story here at Dreamers & Fighters in the Children of the Blacklist section. Click on http://www.dreamersandfighters.com/cob/doc-rickwinston.aspx to read it. I was fortunate enough to have you as a geometry teacher when I was a Junior at Highland Preparatory School (1964-65), that "small private school in Queens" that was mentioned in your biography. You may not remember me, as I was not a wonder as a math student. You were kind enough to take note that I did work very hard. You were also gifted enough as a teacher to help me to do my best and pass the class. As a career science teacher myself, I know how much thought, work and heart that takes, and I have always been grateful to you for being the teacher that you were/are. You were one of the examples that I followed in my own career. To now know how many challenges you faced during that time, adds to my admiration. 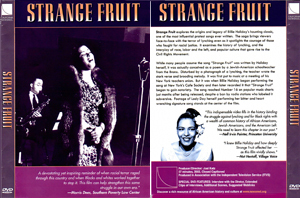 In concert with reading about Abel Meeropol's song, Strange Fruit, please link to these sites about our friend, Joel Katz's compelling award-winning documentary, Strange Fruit. It addresses the history prompting Meeropol to compose it and the controversy the song provoked. The story is told in part by jazz performers, historians and activists as well as their sons, Michael and Robby Meeropol. Pete Seeger, Henry Foner, and Honey and Bernie Kassoy also offer their personal remembrances of their New York City Teachers Union friends, Anne and Abel Meeropol. The documentary on DVD is available for purchase from these two Web sites. Professor Smith generously shared the link that provides further information about Teachers Union members, Henry, Jack, Moe and Phillip Foner, Morris Schappes and the other victims of the Rapp-Coudert Committee (1940-42). The beginning of the first wave of investigations that our documentary Dreamers and Fighters: The NYC Teacher Purges addresses, started with the Rapp-Coudert dismissals. "Those stories began in 1940, when the New York State Legislature created the Rapp-Coudert investigating committee, whose repressive techniques cost about 50 college teachers and staff at City College their jobs in 1941 – the single largest purge of college teachers in U.S. history. It laid the basis, after WWII, for the McCarran Committee to use the Rapp-Coudert Committee’s list and techniques to carry out the extensive witch hunt that plagued the New York City schools during the 1940s and 1950s, and from which they have still not recovered." Carol Smith’s online site is based on the exhibition, "Protest and Repression: The Struggle for Free Speech at CCNY, 1931-42," mounted at The Graduate Center, CUNY, February 4 to March 4, 2005. I'm really pleased to read about your project and your efforts to finally bring forth the history of that sorry period of our lives. My first exposure to the Smith Act persecutions of the teachers and other progressive professionals occurred when I attended the trials being held in Philadelphia in 1953- I was a high school student at the time and the witnessing the procedures of that court was truly mind opening. I subsequently came in contact with the music of Pete Seeger, the Weavers, Paul Robeson and the left leaning folk scene and my political consciousness began. After spending three months in an Air Force stockade for reading and talking about my newfound views, I was discharged as a "security risk". My treatment in the military simply ratified my conversion. A few years later, during the newly popular enthusiasm for folk music, I became a member of the Chad Mitchell Trio. We became protégés of Harry Belafonte and subsequently became active in the Civil Rights and antiwar movements. If you are familiar with our music, you may aware of the social and political content of our recordings at that time. The Chad Mitchell Trio is still performing periodically in concerts and recently sang for President Obama at Rep Dave Obey's 40th Congressional celebration in DC. For the past 35 years, I've been a Episcopal priest and fully active politically in the inter faith community and union organizing. Oh yes - these days I'm a fellow member with Pete Seeger, Noam Chomsky , Dave McReynolds, Angela Davis , et al in the Committees of Correspondence For Democracy and Socialism - so the work goes on! Please keep me informed about the progress of Dreamers and Fighters and let me know if I can contribute in some way. You might want to check out the Trio's Web site (chadmitcheltrio.com) and consider using our recording of Tom Paxton's great song "What Did You Learn in School Today" in your documentary. Yours in the ongoing movement.